With over 20 years experience in landscaping design, we have the capability and expertise to make your special home project a huge success. We are licensed, bonded and fully insured. We use the latest in design technology and green building practices, enabling us to be on the forefront of innovation. Our landscaping projects vary from simple to simply spectacular. From conception to project completion we will treat your home as if it were our own. No job is too big or to small and a free consultation can show you all the options available. We guarantee complete customer satisfaction and we are going to take great care of your property. 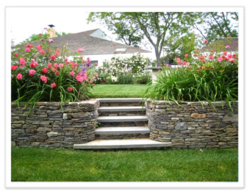 Christopher Smalkais Landscape Design, LLC located in Monroe, Connecticut, is a Landscape design/build company that proudly serves clients in Fairfield County and surrounding counties in Connecticut. We create custom landscape designs for both residential and commercial projects. Our company believes that your landscape should be an extension of your home, a place where you can enjoy the "great outdoors" in your own backyard. We help to create the landscape design of your dreams by taking into consideration your landscape ideas, desires, lifestyle, and budget. We are the landscape construction company for you because we provide a quality, turnkey installation that will continue to increase the value of your property. Copyright © 2018, Christopher Smalkais Landscape Design, LLC. All rights reserved.